Our Crafter’s Choice Pro Base White is very white. It has a low odor that does not compete with fragrance. 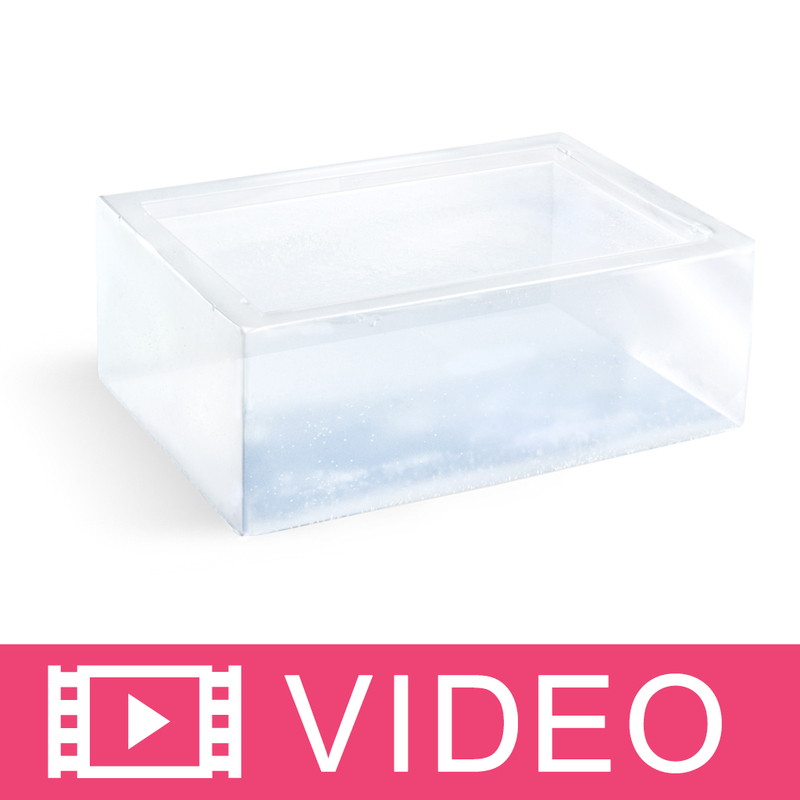 This base is formulated with low water content for less shrinkage and easy unmolding. Customers love the low sweat qualities, which is typical in average weather conditions. Package: 24 lb Big Block Melt Point: 120º F.
Sorbitol, Propylene Glycol, Sodium Laureth Sulfate, Sodium Stearate, Sodium Myristate, Sodium Laurate, Titanium Dioxide. Sorbitol, Propylene Glycol, Sodium Laureth Sulfate, Stearic Acid, Water, Sodium Hydroxide, Myristic Acid, Lauric Acid, Titanium Dioxide. "This is one of my favorite melt @pour soap base. " COMMENTS: Will pay the extra, holds my other carrier oils! Soft & bubbly. I sell out like crazy in Chicago! Give it a try, you won’t regret it! "Melt and Pour Bars and embeds for cold process"
COMMENTS: Melt and Pour is new to me. Ive just stuck to Cold process and I enjoy filling orders quickly without a long cure time. COMMENTS: Easily the best out there. Melts and mixes well with a variety of ingrediants! • The wrapping is a bit of a hassle. COMMENTS: It is beyond so silky. Easy to cut. Takes to scent easily. COMMENTS: I love this base! It is really white, easy to work. The base set quickly and has a wonderful rich lather! I did some mixing of this base and the Pro Clear, came out beautifully. I like this base better then the Shea base and the Premium white base. COMMENTS: Great quality base at a great price!! COMMENTS: I may be fooling myself, but I think this product unmolds easier than your Basic White. Anyway, love it! COMMENTS: Lathers well, moisturizes, soothes skin irritations, can be used on face! What more can I say? COMMENTS: I have used this product from 3 or 4 other vendors however never have I had such an awesome experience with this product. From the minute I touched it I could tell it was different. It was almost like holding cocoa butter it was so moist. I had no idea a melt and pour could be this yummy. On to the melting. It melts faster than most melt and pour bases. It is much creamier and needs less attention. I usually use a spray bottle with alcohol to get the air bubbles off the top of my soap after I pour it. I was making 24 heart shaped molds and only about 3 of them needed spritzing. Add in the free shipping and I will NEVER go back to my old vendors! COMMENTS: Love everything about this base. So easy to work with. COMMENTS: This is my favorite soap base to work with. It is consistently easy to work with, to cut, to pour and it sets slowly but not too slowly. This base takes scent well, unmolds well and creates a beautiful bar of soap that lathers well and looks professional when completed. "Crafters Choice Pro Base MP White"
COMMENTS: WSP Pro Base is one of the best M&P bases I have ever used. Good creamy lather, accepts additives well and unmolds with ease. Great price for the quality. Fragrance oils stay true because I find this base has no lingering smell as some of the other bases I've tried. Customers love that it doesn't dry their skin out. It's a keeper! "The perfect all around base!" COMMENTS: This is a perfect, no odor base that lets me get creative with color swirling and scent. I love a number of the other melt and pour bases, but this is my old reliable when a friend calls and wants some special scent or colored guest soaps. Good lather, nice feel on the skin, everyone loves this base! COMMENTS: Wow, I'm glad I tried it. It has a thick lather & makes lovely soap. It takes a bit longer to set, but the end product is well worth the extra wait. The price is great also. I'm going to stick with this one:) Thank you WSP for another terrific product! COMMENTS: This base is absolutely wonderful! Accepts essential oils as fragrance better than ANY other base I've ever used. For those with problems unmolding---once base hardens to room temp, I place the mold in the freezer for 30 minutes. When I take it out of the freezer, in less than 5 minutes the soaps pop out with just a little rubbing with a cloth on the back of mold. PLEASE keep this base...it is the best I've ever used. Amazing lather. Thank you, thank you, thank you! "Excellent Lather & Bright White!" COMMENTS: This is by far the best soap I have found. Bright white & looks wonderful in finished soaps. Lathers more than other soaps & I find it is creamier than others. I love this one! It's a keeper. COMMENTS: I ordered this in the suggestion of one of the staff there and they were right! Creamy and rich, holds scent and color great. I made a oatmeal, honey & Almond soap with and it was amazing my skin was soft and not dry. Made several other types with it also and sold every last bar! Will be ordering again! Way to go!!!!! COMMENTS: I am so glad WSP has come out with a less expensive base. I saw no quality differences in my finished soaps. They did take about 15 more minutes to firm up but the next day they seemed to be a harder soap than others I have made with different bases. This is not bad just different. I agree with the other review...Great White Color! Thank you WSP! PS - Your customer service rocks! COMMENTS: A +++++++ Highly recommend. Best base for price. Great White Color! "I am looking for a white base that doesn't sweat much and finished product looks similar to cold process. Will this work? " Staff Answer This is a great soap base with very little sweating. By using more muted colors, you might be able to get this to look similar to CP. "Can some of the dry milk-type additives you sell be added to the "Pro" M&P base to enhance the finished bars both in quality and market-ability without causing problems with sweating or reduced lathering. "